As parents, we do our best to keep our kids involved in productive activities, while hopefully leaving us enough energy at the end of the day to get the laundry done. 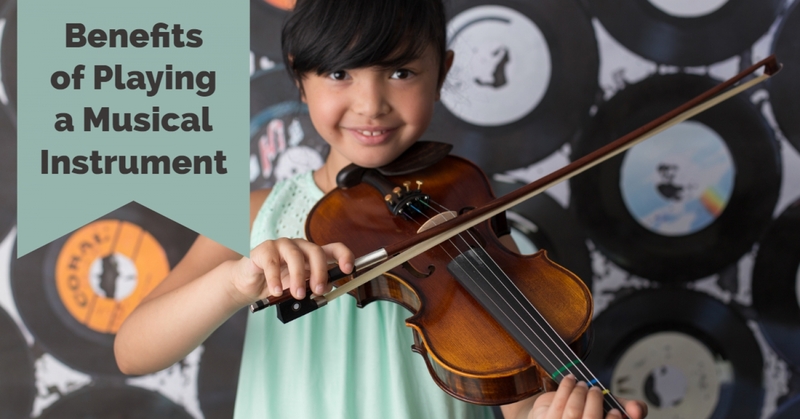 In between sports and school activities, you may even recognize that your kids have musical talents that need fostering. The truth is that signing your kids up for music lessons can change their life forever. Musical instruction has a way of bringing out the best in kids. It gives them their own sense of purpose each day and it’s something that they can look forward to just as much as video games or Snapchat. Best of all, music allows kids to creatively showcase their talent with confidence and its something that requires very little effort from us as parents except for sitting back and enjoying the occasional recital. Taking music lessons is a great rite of passage for children and you will see the benefits spill over into their every day school life. Check out these five benefits of taking music lessons. 1. Our thought processes are improved. Musically trained kids typically outperform non-musically trained kids on cognitive tasks. They perform better on tests of word recall, nonverbal memory, and cognitive flexibility. Other results show that playing an instrument can increase your IQ and if you look at most leaders in society, most of them will tell you that they played an instrument as a kid. 2. Kids learn to manage their time with less video games and Youtube. Imagine if some of your child’s Fortnite time could be channeled elsewhere. Music, by nature, is timed. So in order to learn to play, students must learn to organize their thoughts in terms of time structure. For instance, when learning a new piece, a student will begin to dissect the composition, focusing on the difficult passages first. This strategy is extremely efficient, and allows the student to progress more quickly as a musician. When the student sees the resulting improvement, it creates even more motivation! Therefore, kids will gradually train their brains to process all-new information in terms of time and structure. This aids in the management and organization of tasks, extending far beyond the playing of their instruments. Let’s face it. Our kids are stressed out between school activities, long hours of homework, and learning basic coping skills. Playing music, or even just listening to it, is a great way to relieve stress. It doesn’t matter if the music is soothing or extremely exciting. Either will help you get lost in the sea of sound. And when you are totally immersed, it’s much easier to relax! Playing an instrument also releases endorphins into your child’s body, which naturally reduces their stress level. Playing music has many soothing effects on the mind and body. Studies suggest that music therapy helps children and teens with attention deficit hyperactivity disorder (ADHD), insomnia, and depression. Basically, we could all use a little stress relief through music. 4. Our confidence and self-expression become ignited! When kids reach a certain point in their musical education, they’ll be able to express themselves by playing whatever kind of music they want. They might even write their own music, and it could be in a whole new style that no one has even heard yet! Music can become a great outlet for your child’s emotions. Best of all, playing a musical instrument builds self-esteem and a strong sense of identity. 5. Music lessons teach discipline, responsibility and perseverance. It takes effort to learn how to play a musical instrument. And when kids start getting good at your their skill, they’ll get to see just how much that effort has paid off. It’s ultimately up to the student to put in the work. Once you child gets to a certain level, they will realize that with dedication, the sky is the limit! Although kids can make great progress in lessons without being forced to practice, maintaining a consistent practice schedule trains kids to be disciplined. The lessons and skills learned from consistent practice build commitment, and aids in many other aspects of life. Best of all, it’s just plain fun! Playing music is a blast. Many students choose to start their musical study on piano, voice, guitar, drums, violin, or even ukulele but there are tons of instruments to try out. Talk to your kids today about adding music into their 2019 schedule to join in on the fun! About the author Talonda Thomas, Ph.D.
Talonda Thomas is the author of the Amazon Best Selling book Screw the Business Plan and the owner of the National Award-Winning New York Musician’s Center in Bellmore. Dr. Thomas uses her experience as both a public school music educator and entrepreneur to bring the arts to kids across Long Island. In addition, she coaches small business owners on how to launch and grow their service-based businesses.